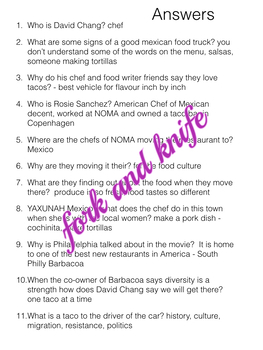 This episode does that with some of the heaviest hitters in current food culture. 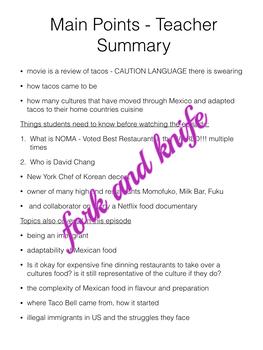 It also covers what is a Taco and how it has changed and adapted as cultures move through Mexico. David Chang is the interviewer through most of the episode. Warning!!!! There is swearing &%^$#. Included in this package is page of questions to answer about the movie and a teachers version with answers. 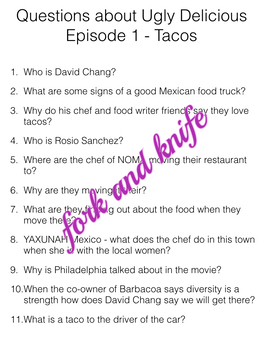 It would be helpful for students to know who David Chang is before the episode and NOMA the restaurant.